Habit: Shrub, generally < 4 m. Stem: generally erect; nodal spines 0--9; internodal bristles generally 0; twigs generally hairy, generally glandular. Leaf: simple, alternate, generally clustered on short, lateral branchlets, petioled, generally deciduous; blade generally palmately 3--5-lobed, generally thin, generally dentate or serrate, base generally cordate. Inflorescence: raceme, axillary, generally pendent, 1--25-flowered; pedicel generally not jointed to ovary, generally hairy or glandular; bract generally green. Flower: bisexual, radial; hypanthium tube exceeding ovary; sepals generally 5, generally spreading; petals generally 5, generally < sepals, generally flat; stamens generally 5, alternate petals, generally inserted at level of petals (hypanthium top), anthers generally free, generally +- not exceeding petals, generally glabrous, tips generally rounded; ovary inferior, chamber 1, ovules many, styles generally 2, generally fused except at tip, generally glabrous. Fruit: berry. Genera In Family: 1 genus, 120 species: northern hemisphere, temperate South America. Some cultivated as food, ornamental. Note: Hypanthium data refer to part above ovary; statements about ovary hairs actually refer to the hypanthium around the ovary. At one time included in Saxifragaceae. Unabridged Note: The family name Grossulariaceae has been conserved, evidently because the genus name on which it is based, Grossularia, is illegitimate. eFlora Treatment Author: Michael R. Mesler & John O. Sawyer, Jr. Habit: Plant < 1 m. Stem: spreading or decumbent; nodal spines 1--5; internodes +- bristly or not. Leaf: blade 1.5--2.5 cm, generally lobed +- to base, glandular-hairy. Inflorescence: generally > 5-flowered; pedicel jointed to ovary. Flower: hypanthium 1 mm, saucer-shaped; sepals 3--4 mm, green, green-white, or pale yellow; petals 1 mm, red. Fruit: 4--5 mm, orange-red; bristles glandular. 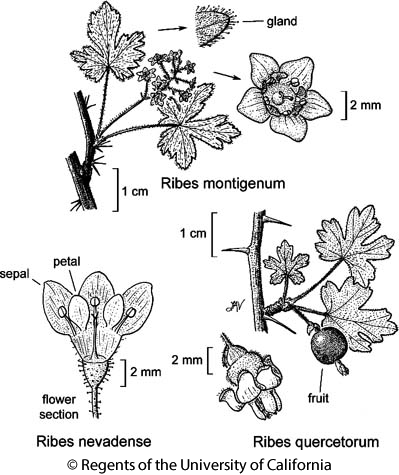 Jepson eFlora Author: Michael R. Mesler & John O. Sawyer, Jr.
Citation for this treatment: Michael R. Mesler & John O. Sawyer, Jr. 2012, Ribes montigenum, in Jepson Flora Project (eds.) Jepson eFlora, http://ucjeps.berkeley.edu/eflora/eflora_display.php?tid=41429, accessed on April 25, 2019. KR, NCoRH, CaRH, SNH, TR, SnJt, Wrn, n DMtns; Markers link to CCH specimen records. Yellow markers indicate records that may provide evidence for eFlora range revision or may have georeferencing or identification issues. Purple markers indicate specimens collected from a garden, greenhouse, or other non-wild location.